Irish scientists link them to cancer, stroke and heart attacks. Wind farms can contribute to people getting diseases such as cancer and heart attacks, two leading Irish health experts have warned. They say that noises emitting from turbines lead to sleep deprivation that can cause cancer and heart disease, along with a number of other illnesses. Professor Graham Roberts, head of the Department of Endocrinology at University Hospital, Waterford, and Professor Alun Evans, an expert in public health at Queen’s University, Belfast, met Alan Kelly yesterday to warn the Environment Minister that the current guidelines in Ireland are a cause for alarm. The rules allow turbines and power lines as close as 500 metres to a family home, while international standards demand they should be at least 2km away. Prof Evans, recently wrote a report pointing to ‘serious adverse health effects associated with noise pollution generated by wind turbines’. The risks were due to sleep disturbance and deprivation with loud noise being one of the main causes. He pointed out that sleep deprivation is associated with memory impairment in children and disturbed cognitive function in adults. He told the Irish Daily Mail yesterday that distances between homes and turbines should be increased. Prof Evans explained: ‘It is a problem, the big thing being noise and sleep deprivation. Once you deprive people of sleep you make them more liable to become overweight and you delay their learning because while we sleep we reinforce memory. And in his recent report, Dr Evans said that there had been no proper cost-benefit analysis in Ireland before the widespread introduction of wind power. Both he and Dr Roberts believe there are fundamental technical errors in reports on current wind farm and power-line projects here. They are concerned over the consultation process with the public. Some parents of autistic children have particular fears about the effects turbines and high-voltage pylons have on their quality of life. John Callaghan has objected to wind farms in Co. Meath, which he fears will affect the environment and health of his autistic son. The engineer, who has studied renewable energy at postgraduate level, said his seven-year-old son is autistic and very sensitive to noise and says he has ‘grave concerns’ about the impact of the proposed wind farm on his son, himself, his family and the local area, including wildlife, heritage and the cultural landscape. The meeting between the professors and the minister was organised by community campaigner David Reid of the Westmeath Alliance. Mr Reid said there are significant concerns about noise pollution for people living close to wind turbines. He said the World Health Organisation refers to this as ‘environmental insomnia’, if the noise is above a certain threshold. However, last year, a review of 500 international studies could find no proof of adverse health effects caused by exposure to electromagnetic radiation. Pylons and mobile phones emit electromagnetic radiation and some experts believe that high levels of exposure to this radiation could seriously affect our health, possibly causing cancer. But the EU experts said they could not find a direct link between electromagnetic fields and childhood leukaemia, despite evidence of a slightly higher risk of incidence. 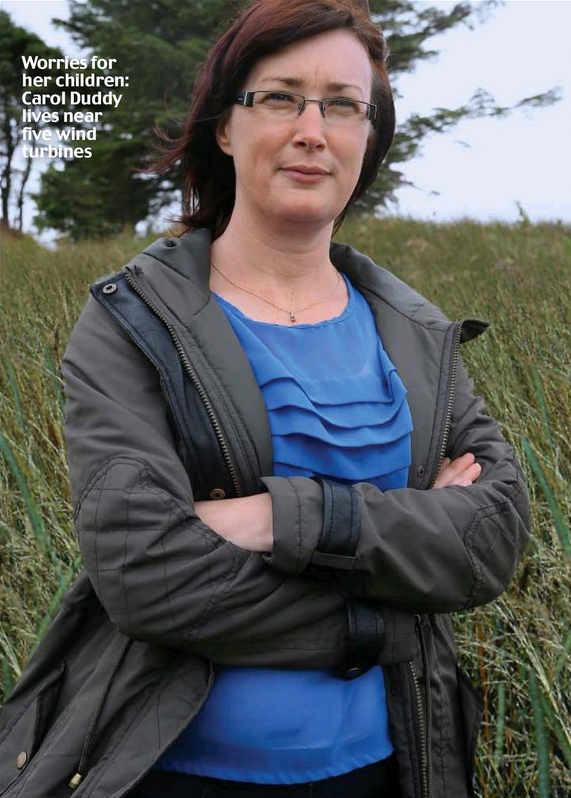 And Kenneth Matthews, CEO of the Irish Wind Energy Association, said: ‘Significant evidence, both at home and abroad, tells us that wind energy is not harmful to people. ‘We would be keen for any debate on this matter to be based on fact and the examination of credible evidence so not to cause completely unwarranted concern to the general public which could threaten one of Ireland’s indigenous industries. The Environment Department has commissioned a study to review and report on international developments on the potential health effects of electromagnetic fields. In a statement yesterday, the department said representatives from a number of departments, with national and international experts, are overseeing the study which is being undertaken by RIVM, the Dutch National Institute for Public Health and the Environment. Carol Duddy said she is concerned about the potential long-term effects of living near wind turbines. Ms Duddy, 42, lives In Corkermore in Co. Donegal and she said her house is more than 500 metres away from a wind turbine, which is one of five nearby. She has two children, Danielle, 19, and Jordan, 16. She said there is a ‘constant buzzing’ In the house which is more prominent on the right-hand side of her house where she and her daughter sleep. She has been living in the house since 2009 and said that wind turbines went up a year later. Ms Duddy said: ‘You hear it all the time, you go to bed and it’s like a buzzing in your ear. ‘It is very annoying. There are times when it would be noisier than others, you’d think they’re in full flow tonight. But the Incident shocked her and she refused to ignore it. ‘I caused serious uproar that time,’ she said. And the noise isn’t the only problem she has. ‘Some people can come into my house and they can’t hear anything, others say what is that? I think it is people who would have more sensitive hearing.